The following image is the first teaser picture published by Korean auto manufacturer that presents the new 2010 Kia Magentis, the next generation of middle-class luxury sedan that will debut in April at the New York Auto Show. As you see, 2010 Kia Magentis presents more sportive, with new grid and space for passengers and luggage, being now more spacious due to higher scale than the previous version. 2010 Kia Magentis is well known on non-European car market, as the Optima, and marketing of this new model is scheduled for next spring. 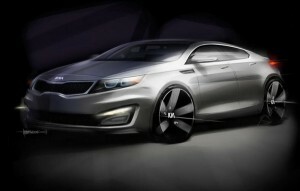 The price for the new 2010 Kia Magentis will be announced soon.